Konishi Hirosada (ca 1810 - 1864) Portrait of the Actor Onoe Tamizo II, c.1850. Deluxe Chuban. 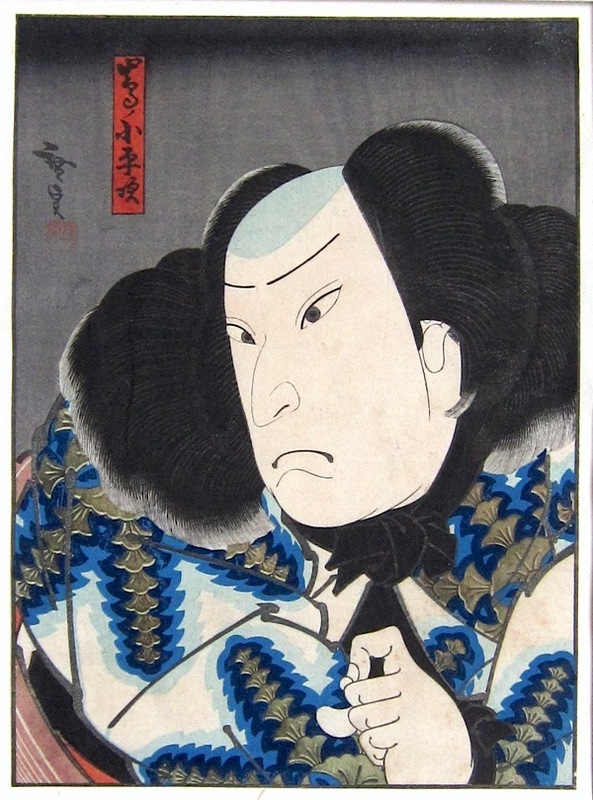 A superb deluxe print in fine condition portraying the Osaka actor Onoe Tamizo II (1799 - 1886). Tamizo was a ‘Kaneru Yakusha’ - an actor skilled at any kind of role and excelled at costume changes. The pensive face of Tamizo looms out of the thicket of hair above a great, mountain-like body and a richly decorated kimono. The fabric is picked out in shades of blue and gold ink. Fine colour, impression and condition. Mounted onto Japanese paper.